Sunrise Radio Alarm Clock Just $24.99! Down From $90! You are here: Home / Great Deals / Amazon Deals / Sunrise Radio Alarm Clock Just $24.99! Down From $90! If you’re looking for an alarm clock then check this great deal at Amazon! Sunrise Radio Alarm Clock is now on sale for just $24.99 down from $89.99 PLUS FREE shipping with Amazon Prime or for orders over $25! This alarm clock gently wakes you up with natural light and natural sounds, giving you a relaxing mood in the morning. It could also use as bedside lamp, atmosphere lamp, alarm clock and FM radio. Nice! Easy To Set Up — Vansky Wake Up Light is easy to set the alarm clock or wake up time with the instructions. Touch Control and It adds new Sunset and Snooze Function. 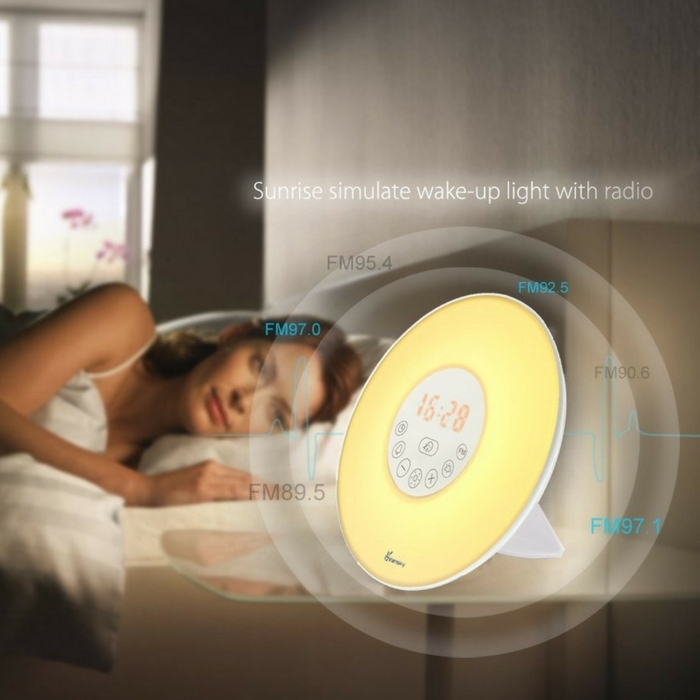 Simulated Sunrise Wake Up Light: Select the time you want to wake up. Lights up 30 minutes before your alarm time, gradually brighten from 1% of brightness to 100% and gently bring you out of a deep sleep. At the alarm time, the alarm sound will plays for 2 minutes, Press button “SNOOZE” enter the snooze mode, the wake up sound will play again after 5 minutes and last 2 minutes. 6 Natural Sounds & FM Radio — 6 natural sounds such as pure music, birds, waves,forest,beeping and so on, which let you revel in the sounds and smells of the nature. As well as 1 FM radio. You can choose your favorite sound. 11 Selectable Light Brightness & 7 Color Light — It can act as an atmosphere lamp by selecting 7 colors (Warm White,Green,Red,Blue,Purple,Orange,indigo）for your preferences. Or work as a table lamp with 11 brightness settings in warm light mode to protecting your eyes from hurting.